Happy Labor Day everybody. So in honor of Labor Day, I watched a movie that featured some of the greatest labor force in movie history. Willy Wonka and the Chocolate Factory is based on a book by author Roald Dahl and contains one of the great performances by the late Gene Wilder. 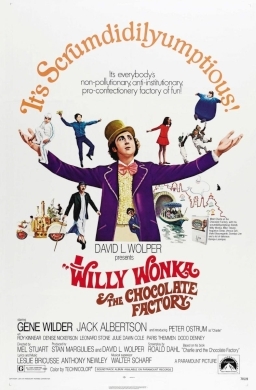 Reclusive chocolate maker Willy Wonka (Gene Wilder) sent out five Golden Tickets in his chocolate bars, giving an opportunity to whomever finds the tickets to come for a tour of his mysterious Chocolate Factory. Local kid Charlie Bucket (Peter Ostrum) finds the fifth ticket and joins a group of rotten little children in the tour of the factory. As soon as Gene Wilder limps out of the factory door, Willy Wonka and the Chocolate Factory becomes a magical fantasy. Not that this is strictly a kids’ movie, because there are multiple moments of darkness involved. Not only the dubious disposal of the rotten children, but some of the wording that Willy Wonka gives indicates his pessimistic view of the kids whom he had invited into his world. Each kid paid the price for their greed or their selfishness, their punishments fitting the crime. Each punishment accompanied with a song from the Oompa-Loompas. Wonka has some of the greatest quips and one liners in movies. He quoted Shakespeare. He made funny quick jokes. Gene Wilder’s timing was perfect. Wilder has had some amazing comedic performances in his career (Young Frankenstein, Blazing Saddles, Stir Crazy), but there have been few roles more perfect for an actor than that of Willy Wonka. Jack Albertson’s Uncle Joe provides a nice balance to Charlie, and his dance during the song “I’ve Got a Golden Ticket” is a highlight of the film. Wilder’s “Pure Imagination,” however, is the most iconic song from the film. “Candy Man” is another well known song from this soundtrack. I love this movie. It is funny, a magical trip of music and childlike wonder. It is Gene Wilder’s greatest performance. It is absolutely a….